Students from the Energy Association at the C. T. Bauer College of Business were awarded first place during the Azerbaijan energy case competition. The winning team included (from left) finance senior Nirav Sheth, MBA student Jennifer Schwegman, supply chain management junior Mit Trivedi, MBA student McLean McGregor and UH law graduate student Shanisha Smith (not pictured). 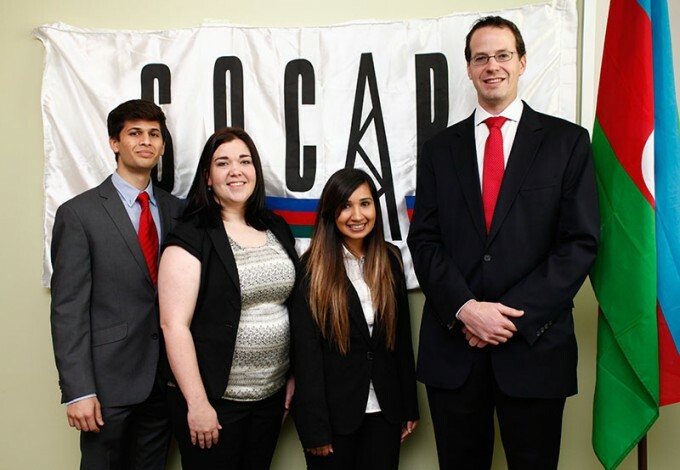 A team of five students from the Energy Association at the C. T. Bauer College of Business was awarded first place for their efforts in aiding top executives from Azerbaijan’s oil and gas industry during a recent energy case competition. The winning team included MBA students Jennifer Schwegman, McLean McGregor, UH law graduate student Shanisha Smith, finance senior Nirav Sheth and supply chain management junior Mit Trivedi. The judging panel of representatives from local industry giants BP, Shell, ExxonMobil and Petrobras selected the winning team because of their ability to offer tangible solutions to the economic situation in Azerbaijan. “Azerbaijan’s current situation has to do with an unstable relationship between the increase in exploitation of natural resources and a decline in their manufacturing sector,” said supply chain senior Mark Diaz, who serves as president of the student organization. The winning team was awarded $1,000 for their work and is also being considered for an internship in Azerbaijan, located between western Asia and eastern Europe. This opportunity would allow the students to put their ideas into action, with the potential to turn the country’s economic future around.